As enterprises run its business operation in the Internet, Web performance directly impacts the e-Business performance. So, Web performance is the benchmark of your e-Business competitive advantage. In order to maintain successful e-Business and meet the service level agreement, enterprise needs a tool to ensure Web performance. eBsuccess Solutions Inc provides MonitorSP Prime to help you manage and control your Web performance from end-users perspective. 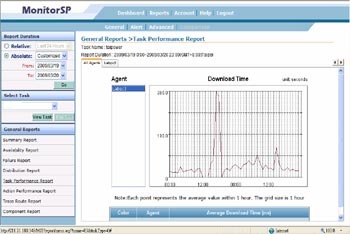 MonitorSP Prime ensures the reliability, availability and response time of your Web application. It emulates end-user experience proactively, measuring from multiple locations around the world 24 hours a day, seven days a week. Enterprises can do scalability test before deployment, and continue performance monitoring and tuning even after. Also, e-Business applications and content changes are frequently. With MonitorSP Prime, enterprises can address Web application issues effectively and consistently provide users with the best performance experience. MonitorSP Prime makes your e-Business portal manageable and controllable, as to protect your investment and revenue. Offer a comprehensive solution to manage and control your Web application performance. Provide a complete insight of system, network and application analysis to managers at anywhere, anytime. Create an objective and quantitative indicator to identify the root causes and bottlenecks of Web application performance. Reduce the workload and time of problems detection. Ensure the cost-effectiveness and productivity of Web applications. From end-user experience and location access, MonitorSP Prime ensures the 24x7 availability, reliability and response time of your Web applications. MonitorSP Prime agenda recorder provides a user-friendly simulation tool, which allows you to proactively record end-user behavior as an agenda. Analyze the time factors of Web page including DNS lookup time, redirection time, connection time, response time and content download time. MonitorSP Prime enables you to diagnose the root cause of problems efficiently and validate content delivery. Track the performance of all Web page components by monitoring the underlying elements of Web applications. Establish proactive event-driven alert functions include Content Validation, Failure Check, and Performance Problem etc. Enhance the business competitive advantage in the marketplace by maintaining high-quality Web applications. Detect, isolate and resolve the problems efficiently before users experience. Facilitate capacity planning and change management by a comprehensive performance analysis. Shorten a great deal of time in pinpoint performance bottleneck by Web performance report. Provide alert to react the problem at the first time and to achieve operation excellence. Assure user’s satisfaction and loyalty by meeting service level of agreement. Ensure the cost-effectiveness of Web applications by comprehensive performance analysis.